Looking for accommodation in Ionian islands? Check out Luxury Holiday Villas in Ionian islands! 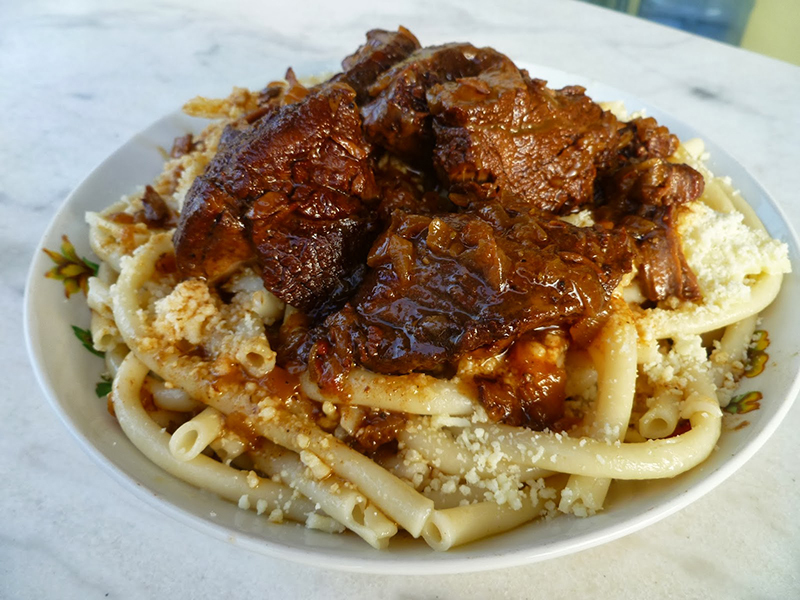 Pastitsada is a Greek traditional pasta dish, that is popularly prepared in Corfu, the second largest Ionian island. The recipe for the dish is thought to have originated from the Venetians, who occupied the island once, as referred above. It features pasta, served in a sauce made from tomato sauce and veal, fish, poultry or beef meat. For flavor, ingredients such as garlic, minced onions, white wine, cinnamon, cloves, bay leaves, cumin and several other traditional spices can be added. Sofrito is one more of the traditional dishes in the Ionian islands and it derives its name from the Italian word “fritto”, which means fried. 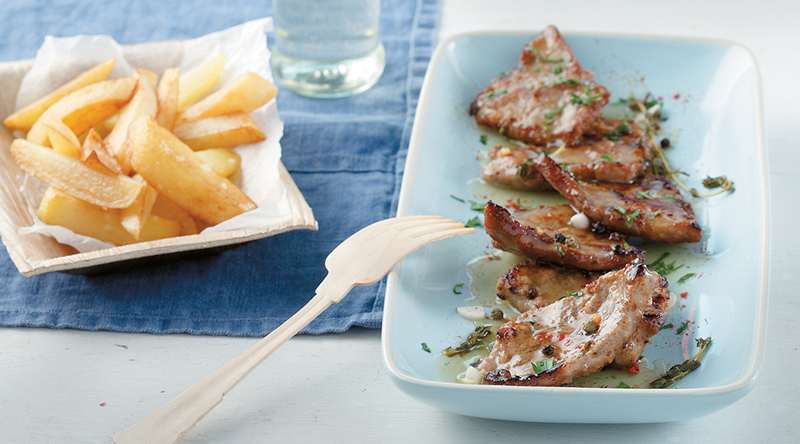 This dish features slices of veal meat, which are dipped in flour and then fried. The meat is then combined with tart sauce, made from garlic and parsley, which is then, cooked using vinegar and white wine. To complete the dish, the combination of the meat and sauce is served with rice or mashed potatoes. 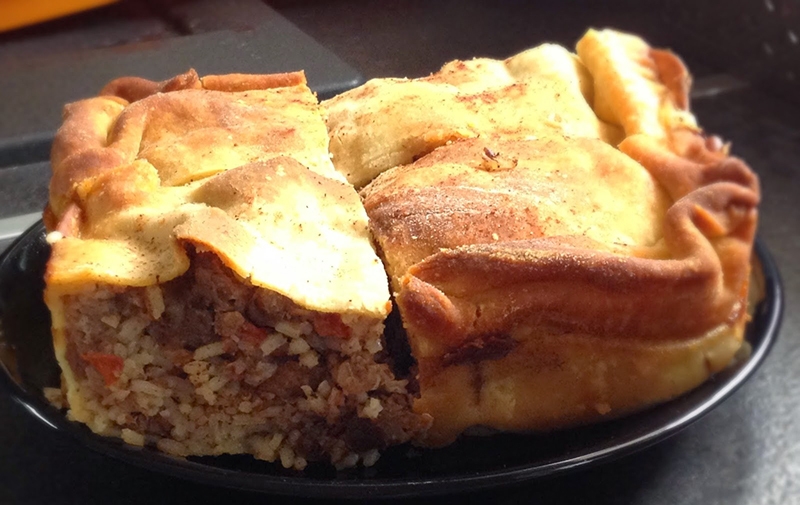 Kefallonítiki kreatópita, which is also referred as “Kefalonian meat pie” is a traditional dish that is mainly served on Kelafonia, the largest Ionian island. It is a popular dish among the locals and tourists, mostly because of its rich flavors of its ingredients: garlic, cinnamon, bay leaf, marjoram, and nutmeg. The dish usually features a mixture of lamb and veal meat that is cooked in a tomato sauce, with cabbages such as carrots and leeks being added. After completion, the tasty combination is cooked into a pie, giving you a very tasty meat pie. Chicken tserépa is a Greek dish from Kelafonia island, which is believed to have originated in Ithaca. It is a traditional dish, which is prepared by marinating a chicken overnight in a mixture of smashed garlic, salt, pepper, oil and oregano. The chicken is then baked with tomato sauce, lemon juice, wine, and potatoes. To give the meal a traditional touch, it is baked in a “tserépa” (a traditional clay cooking vessel), which also helps to ensure that the meat comes out soft and tasty. Lefkadítiki ladópita (oil pie), one of the best traditional dishes in the Ionian islands, is served in Lefkada, a largely undiscovered island. It is a dessert that is prepared using olive oil, as the main ingredient. 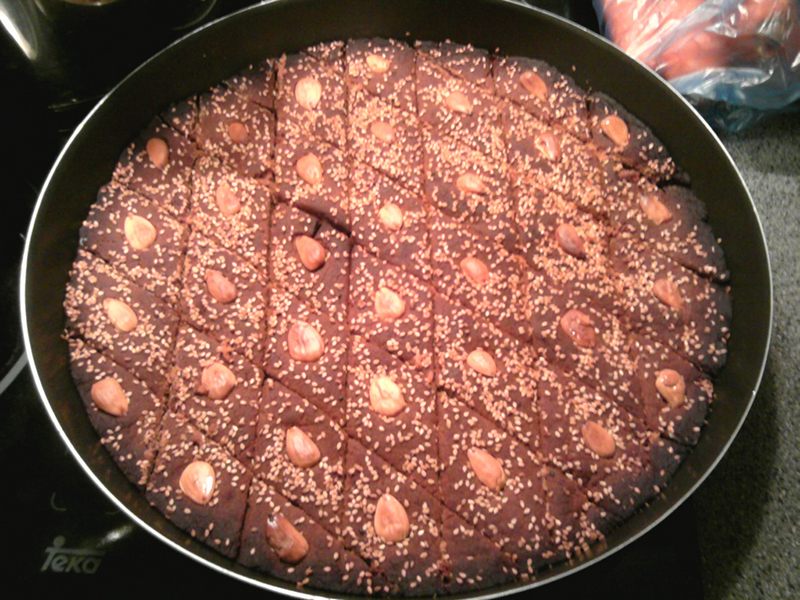 It features a cake, baked with semolina flour and syrup, almonds and sesame seeds on the top. When it is ready, the cake is sliced into pieces and then dusted with sugar and cinnamon, making it a really delicious dessert. Aubergines skordostoubi is a traditional vegetarian Greek dish served in Zakynthos. It features aubergines, which are cooked with tomatoes, carrots and potatoes, and accompanied with a rich red sauce, containing paprika, garlic, and vinegar. A lot of people also add to the sauce cubes of “ladotyri”, a traditional local cheese. 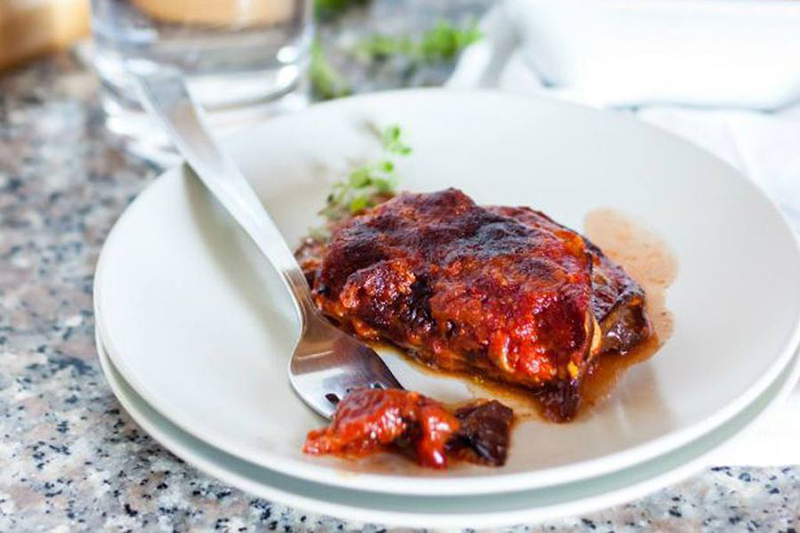 Mousaka is maybe the most popular among the traditional dishes in the Ionian islands. 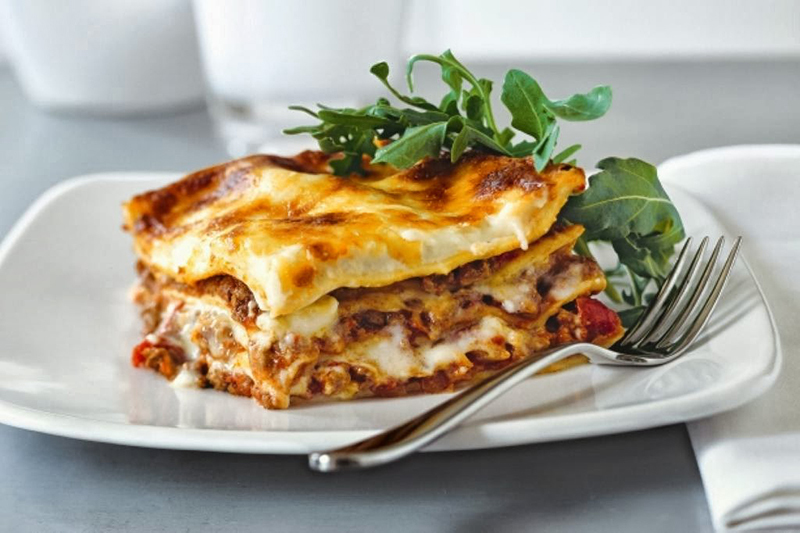 It features layers of aubergines or potatoes and minced meat, with béchamel sauce being used on the top of the layers. The minced meat is cooked with tomatoes, onions, garlic, and other spices such as cinnamon, pepper, in order it flavor to become more intense. The three layers are then placed on a pan and baked till the top side browns. The islands of the Ionian Sea are very popular for summer vacation, with several sightseeing spots, activities and a cuisine really rich in flavors. Book your stay and taste even more traditional dishes in the Ionian islands. Your holidays will get a really unique taste!